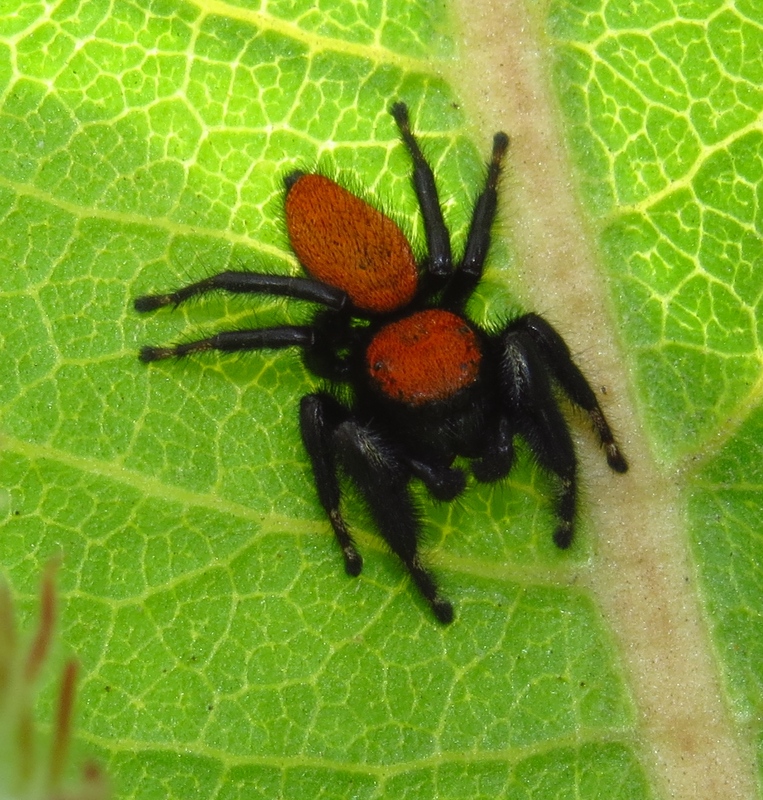 One of the things I look forward to each autumn is the annual Flickr event known as "Arachtober". It is a Flickr group which slumbers between November and the following September, but remains a tradition among arachnophiles and macro photographers. There are always mesmerizing images posted from all corners of the globe. 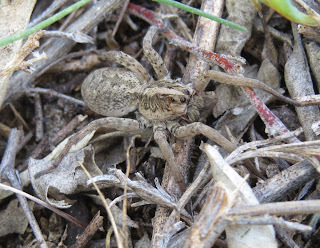 Arachtober manages to recruit several new participants each year through word of mouth, blogs, and sheer curiosity. 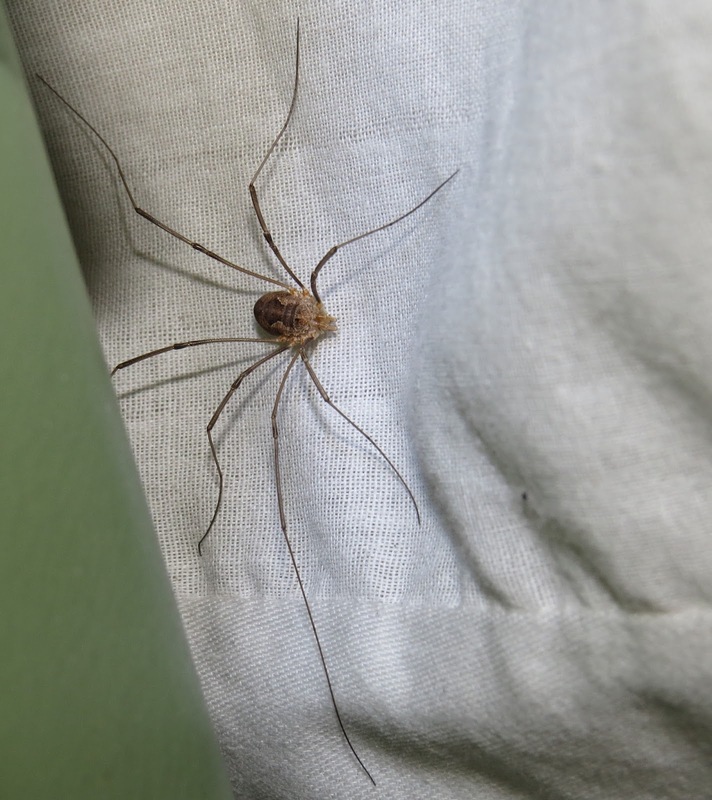 Not only spiders, but scorpions, ticks, mites, harvestmen, and all other arachnids are eligible for inclusion. 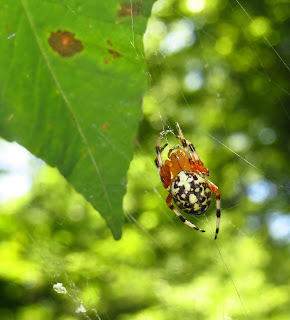 Don't forget the artistry of spider webs, too, whether dew-adorned or dry. The only hard and fast rule of Arachtober is that the images you post to the group must not have appeared on your own Flickr photostream previously. Allowed quantity of images per day varies at the discretion of the group administrator. Overall, interest in spiders seems to be increasing among the general public, and arachnids are achieving a much higher profile than ever before. This is great news, for there is still a great deal of work to be done to combat myth, superstition, misinformation, and fear. 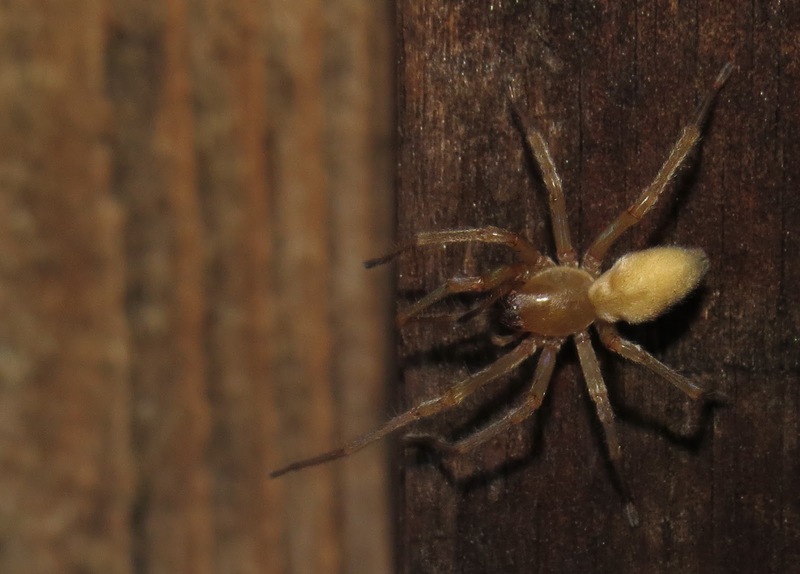 Please consider contributing to "Arachtober" on Flickr, or find another way to dedicate some time to sharing your spider observations, questions, or images. There are many groups on Facebook devoted to spiders and their identification, for example; and presumably, the same applies to Instagram. There is much you can contribute to our collective knowledge by doing so. Thank you. 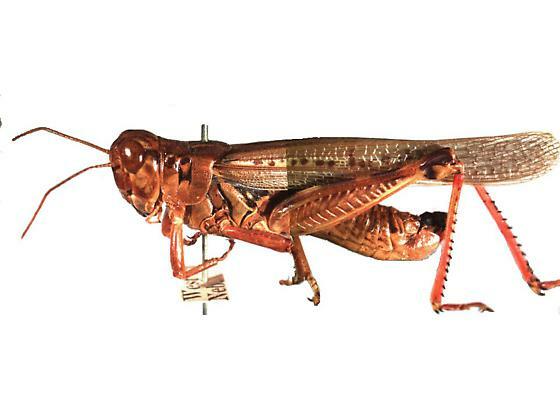 A person on a Facebook insect identification group recently asked a very good question about the difference between a grasshopper and a locust. You would think it is pretty straightforward, but not so fast. 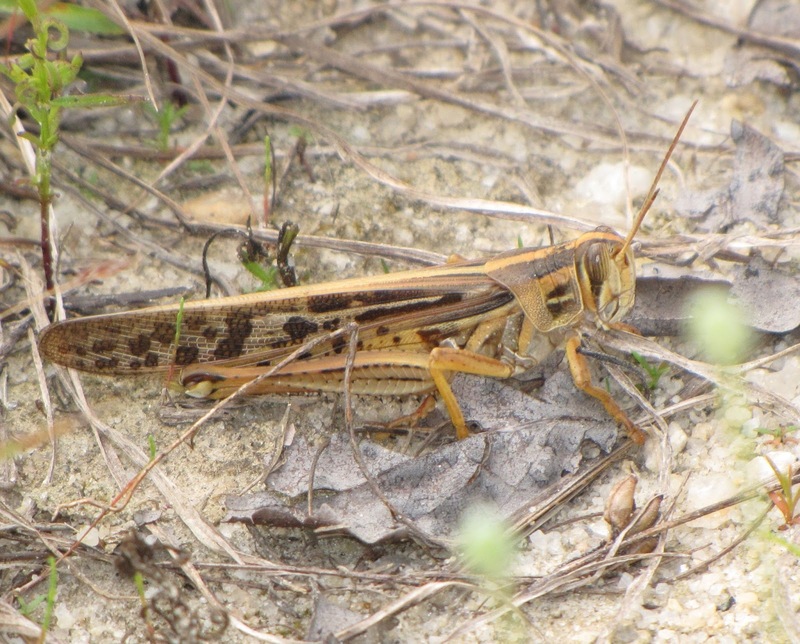 The American Bird Grasshopper, Schistocerca americana, is related to some grasshopper species in Europe and Africa that can become locusts; and it sometimes migrates beyond its usual geographic range in the U.S. Most of us think of locusts in the context of Biblical plagues in Africa and parts of Europe, in ancient times. Such plagues still happen, and they are almost apocalyptic in their destructiveness. They even occur in North America on occasion, as well as other parts of the world, so there must be more than one species of locust, right? Yes, and no. 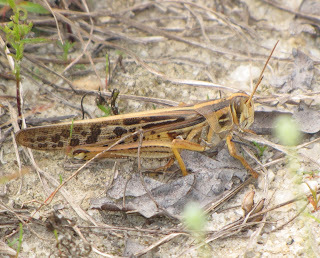 Locusts are not a species of grasshopper, they are the result of overcrowding in the nymph stage of many kinds of grasshoppers. 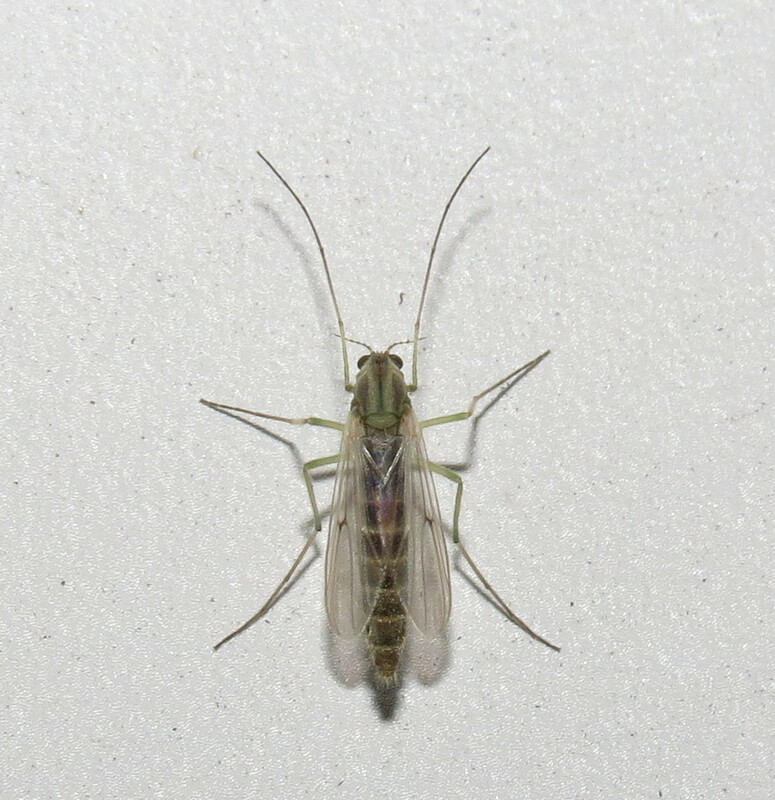 Under favorable conditions, there is an extraordinary survival rate of young grasshoppers, which are called nymphs. 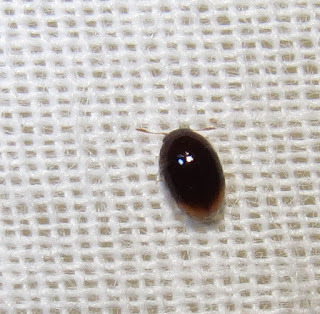 When they are literally so abundant and concentrated that they are rubbing elbows (well, "knees" is probably a more appropriate term), this friction causes them to detour from their normal route of metamorphosis. 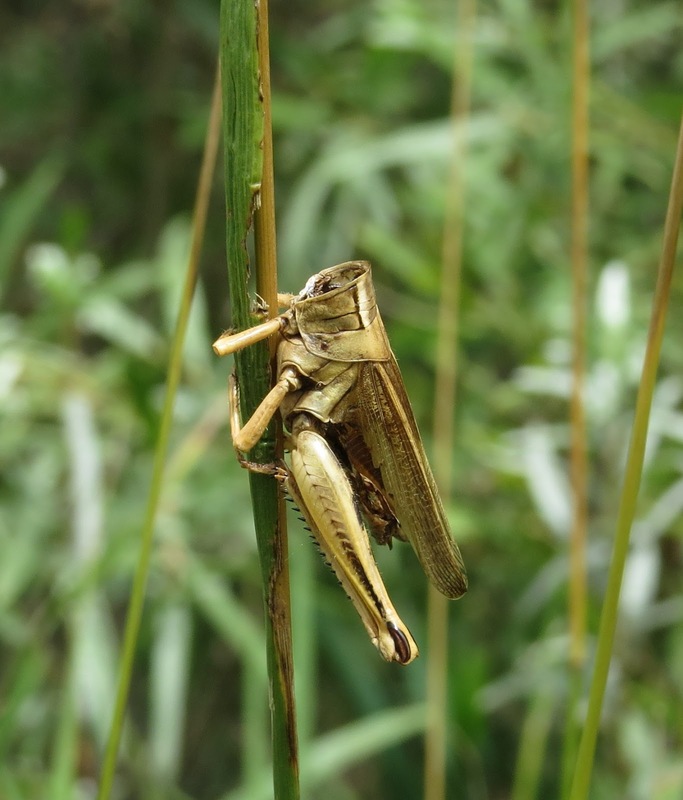 Instead of maturing into the usual grasshopper, the adult stage features longer wings and other body modifications that permit them to fly greater distances, remain airborne for longer periods, and to undertake these migrations from one food source to the next over long distances. They also may be aided by winds ahead of storm fronts. This is something of a simplification of the physiology of locusts versus normal grasshoppers, but a surprising number of species have the potential to morph into locusts when conditions are right. Then they overwhelm the landscape, defoliating every plant in their path. Locust swarms will devour plants they would not normally eat. 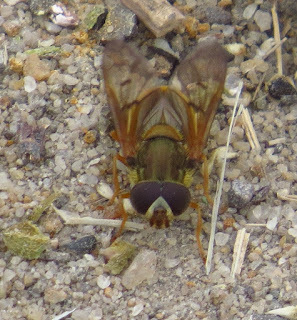 I recall a presentation about a locust epidemic in Oregon where the scientist showed slides of juniper trees (yes, juniper trees) that had been reduced to skeletons by grasshopper swarms. The locusts have even been known to eat garments on clotheslines. Grasshoppers are also omnivores, and will not hesitate to eat dead members of their own species, or gnaw on injured or even healthy ones. 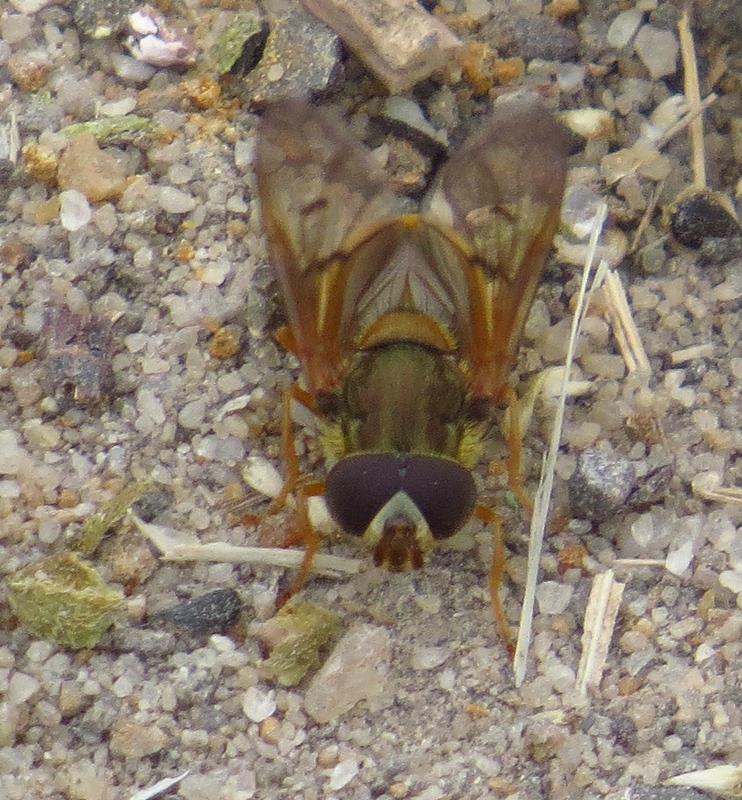 It is late in grasshopper season here now in Colorado, and I regularly see grasshoppers with wings reduced to stubs thanks to hungry comrades. 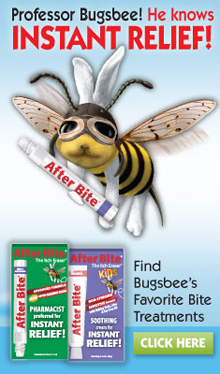 Fortunately, for us at least, grasshoppers face many mortality factors. 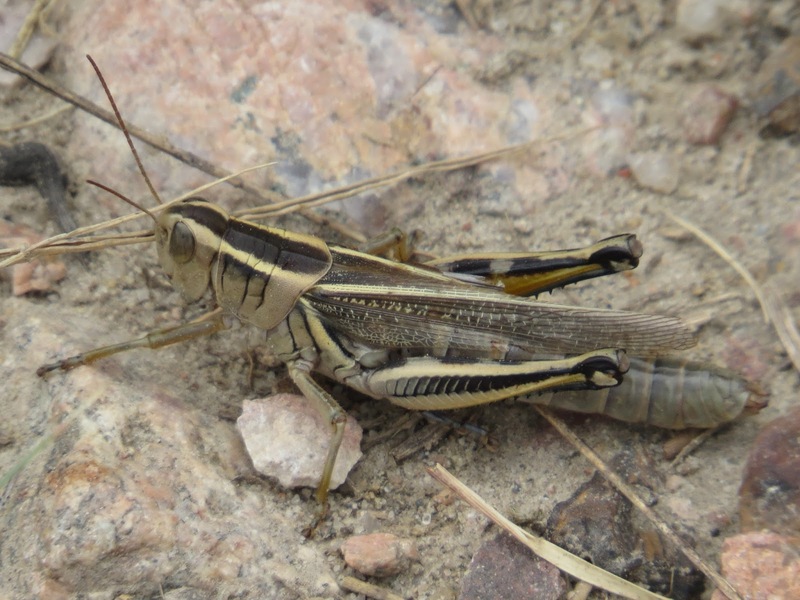 While it has been a banner year for grasshoppers this year along the Colorado Front Range, huge numbers have succumbed to the entomopathic fungus Entomophaga grylli. 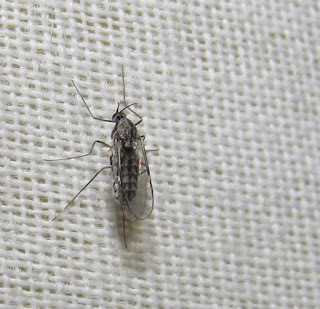 The insidious fungus grows inside the insect, eventually commandeering its brain and forcing it to behave abnormally. The grasshopper, through no will of its own, climbs to the top of a tall weed, assumes a death grip embracing the stem, and dies. The fungal spores then erupt and rain down on healthy grasshoppers below to begin the cycle again. The spores may even decapitate the dead grasshopper as they exit. Grasshoppers are the chief grazers of the prairie, even more impactful than livestock, deer, pronghorn, elk, and bison. 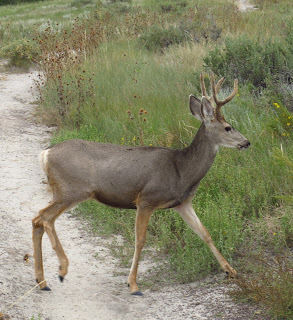 Natural rangeland can usually withstand their feeding, but ranchers obviously see them as competition and exercise chemical controls when necessary. 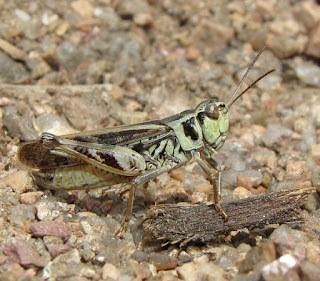 Since grasshoppers are mostly generalist feeders (a few specialize on only certain broadleaved plants), they pose a threat to agricultural crops, too. 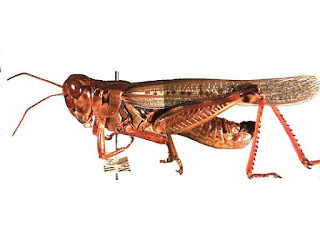 Ironically, the Rocky Mountain Locust, Melanoplus spretus, once the most abundant and devastaging insect pests ever to occur in North America, is now extinct. 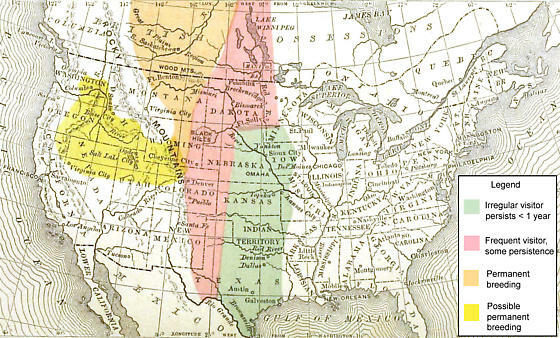 The book Locust, by Jeffrey A. Lockwood, chronicles the rise and dramatic fall of the species, which ultimately vanished from the U.S. landscape by the early 1900s. I will not spoil the solving of the mystery, as Lockwood's account is far more riveting than anything I could craft if I was even prone to writing historical fiction. Let us just say it is a cautionary tale. 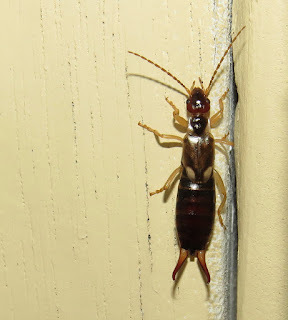 We can certainly be grateful that we seldom experience such traumatic explosions of grasshoppers here on American soil, but we should be empathetic to other nations that do. Entire economies can be on the verge of collapse in the wake of such devastation. 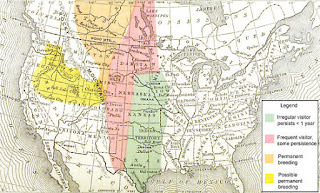 Source: Lockwood, Jeffrey A. 2004. Locust. New York: Basic Books (A member of the Perseus Books Group). 294 pp. 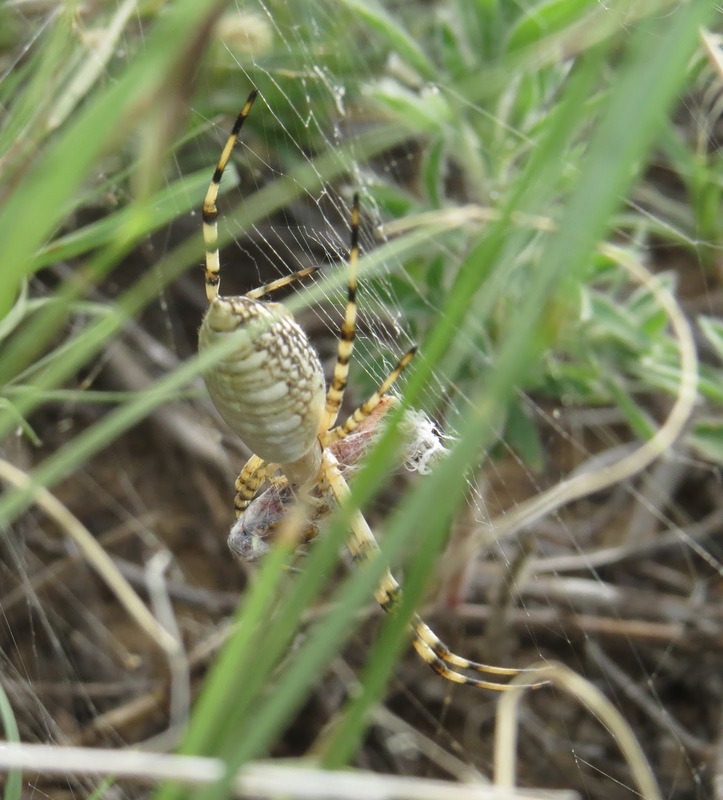 More content will be coming to this blog, more regularly, in October, but I wanted to share a humorous experience from our last bioblitz at Ute Valley Park in Colorado Springs. It was Saturday morning, September 16, and I'd already been up earlier than I usually am, so I will blame my assumptions on being a little tired. Sure enough, I heard a trail runner pounding down the trail, and then stopping abruptly. I thought that was quite considerate and polite, but I hurried even faster to get a respectable image. I said "thank you for stopping" to the obliging jogger, but there was no reply. I finished shooting, and turned to continue on the trail. When I looked up, this was the "trail runner." Naturally, when I related this story to others back at base camp, everyone had to offer their own punchlines. "But what did the buck say?" in reference to the song "The Fox" (What Does the Fox Say? "No, the buck stopped there," punned another individual. Yeah, yeah, hilarious. I do not intend to be quite so assuming in the future, lest the next trail runner be a bobcat, mountain lion, coyote, or bear. Even our urban neighborhoods here can be dangerous to those who are not aware of their surroundings. Happy trails, folks. 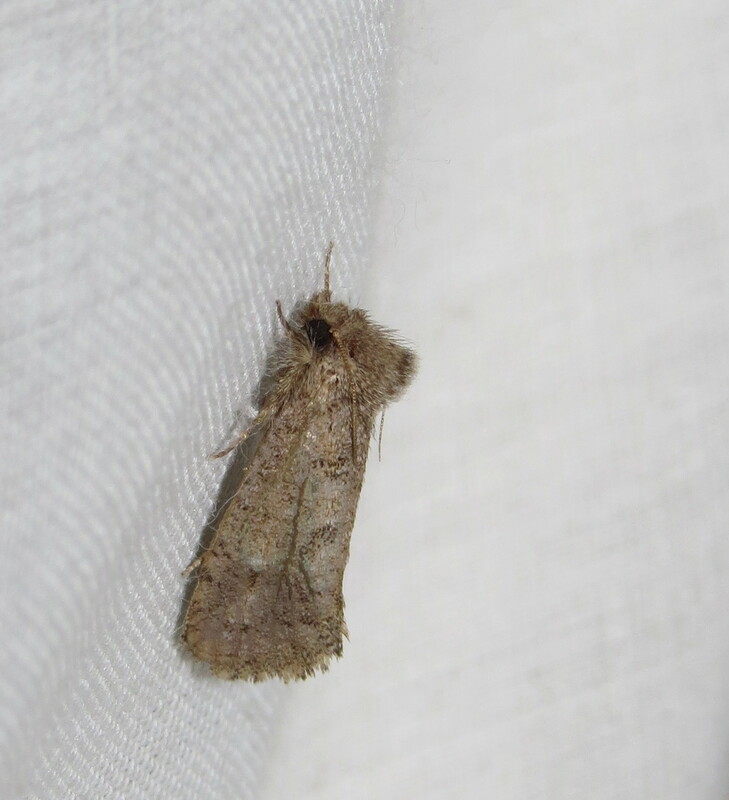 I wrote about this species back in December, 2010 when I had only one image of a sleeping female in South Deerfield, Massachusetts on July 5, 2009. Recently, I had the privilege of imaging another female in Leavenworth, Kansas, on August 24. 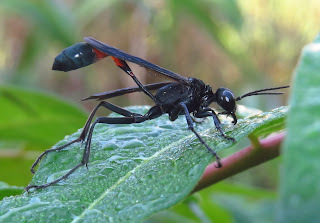 These are large, beautiful insects, velvety gun-metal blue with a red band across the abdomen, and black wings. It can be confused with no other member of the genus Ammophila. This particular specimen spent the night in a patch of weeds and flowering mint, eventually waking up to visit many mint blossoms for nectar. 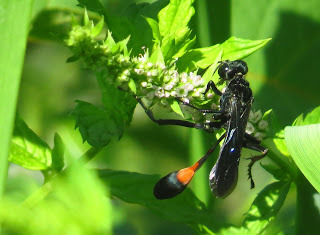 This wasp is known to visit many kinds of flowers, in Illinois at least. 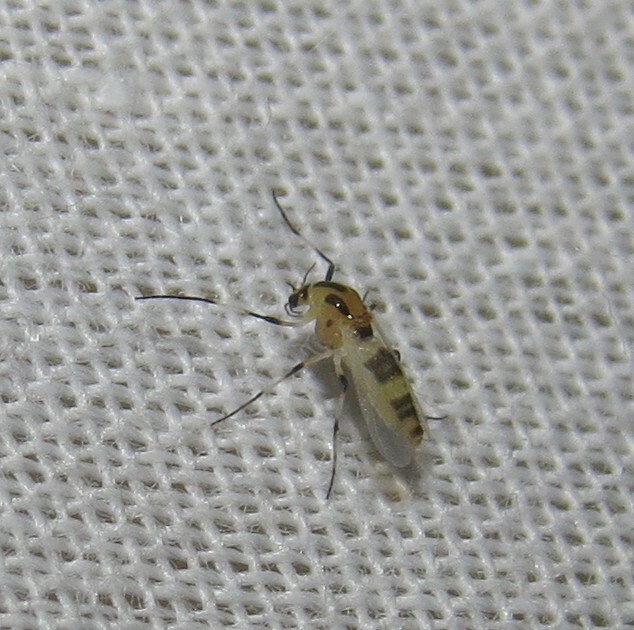 I collected one specimen from Swamp Milkweed in Cincinnati, Ohio. Females need to fuel themselves so as to be able to carry out the tasks of providing for their offspring. 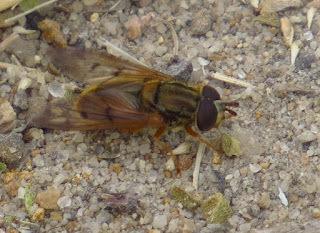 Each wasp is solitary, digging her own vertical or angled burrow in clayey or sandy soil, terminating in a horizontal chamber at the bottom. Once the nest is excavated, it is off to find a large caterpillar. 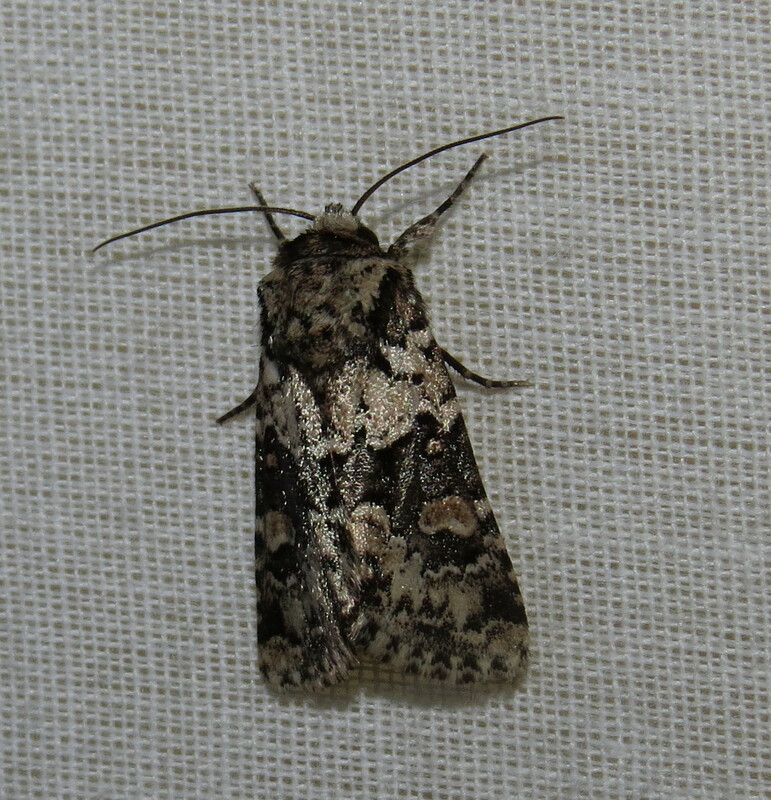 Known hosts include the larvae of underwing moths (Catocala spp. ), the locust underwing (Euparthenos nubilis), and zale moths (genus Zale). Those are hefty caterpillars, but then they are destined to feed the larva of a very robust wasp. 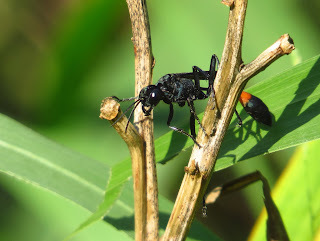 This YouTube video may or may not depict A. nigricans, but the searching behavior must be very similar at the least. The female wasp is not likely to locate a caterpillar based on movement or color, as the caterpillars are very cryptic and usually resting stock still, feeding at night to avoid predators like the wasp. So, she must find her prey by touch. 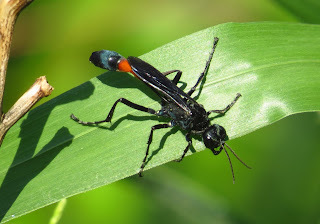 Ammophila nigricans ranges over the entire eastern United States, from Kansas and Texas to New England, and south to Georgia, Florida, and Louisiana. 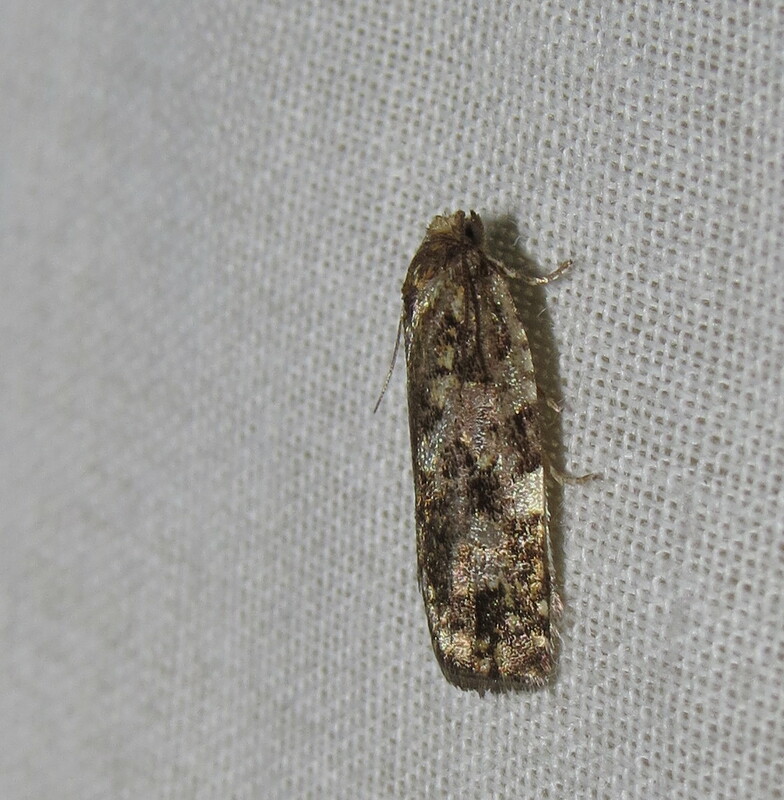 It does not appear to be nearly as common as most other members of its genus, so I consider myself lucky to have had a few hours observing this one specimen. Krombein, Karl V. and Paul D. Hurd, Jr. 1979. Catalog of Hymenoptera in America North of Mexico vol. 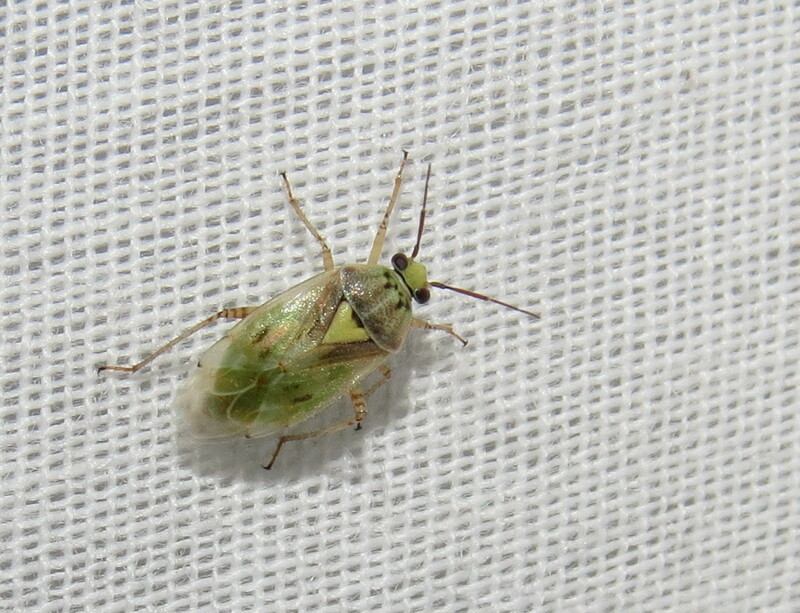 2 Apocrita (Aculeata). pp. 1199-2209. Given the stormy weather during National Moth Week here in Colorado Springs, I took advantage of the few opportunities to find moths here. The nights of July 24 and 30 I draped a sheet over the door of our backyard shed, hung a blacklight, and hoped for the best. 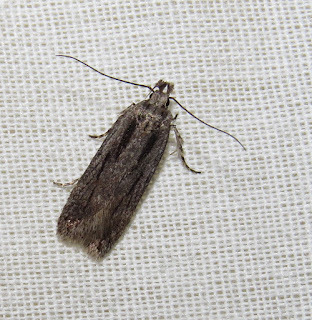 I am rarely disappointed, even if beetles, bugs, and flies are more prevalent than moths. Identifying what comes in is a real challenge, too. Taxonomy, the classification of organisms, is constantly changing as we learn about new evolutionary relationships. 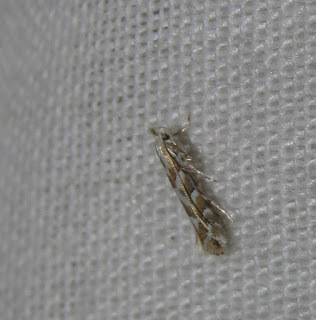 For example, this moth, in the genus Acrolophus, family Acrolophidae, used to be placed in the family Tineidae (clothes moths and their kin). 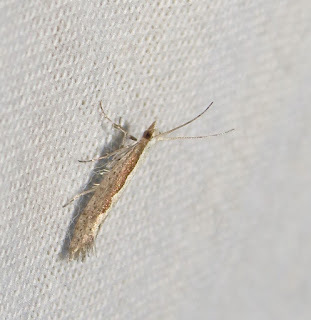 Acrolophus species are known as "grass tube moths" because the caterpillar stage of many species spin silken tubes at the base of grasses, or grass roots, to conceal themselves as they feed. The genus Ethmia, very abundant in oak woodlands in the foothills here, but a rarity at my blacklight on the high plains, used to be in the family Coleophoridae. Now it is in the family Depressariidae. It can be depressing to me to try and keep up with all these changes. 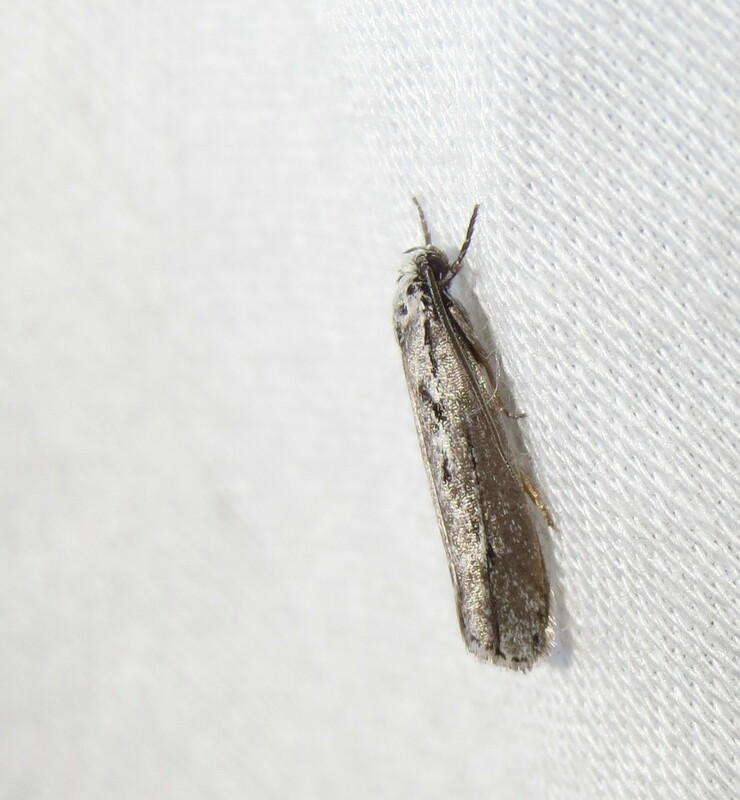 This specimen is probably Ethmia discostrigella, which feeds as a caterpillar on Mountain Mahogany, a woody shrub. 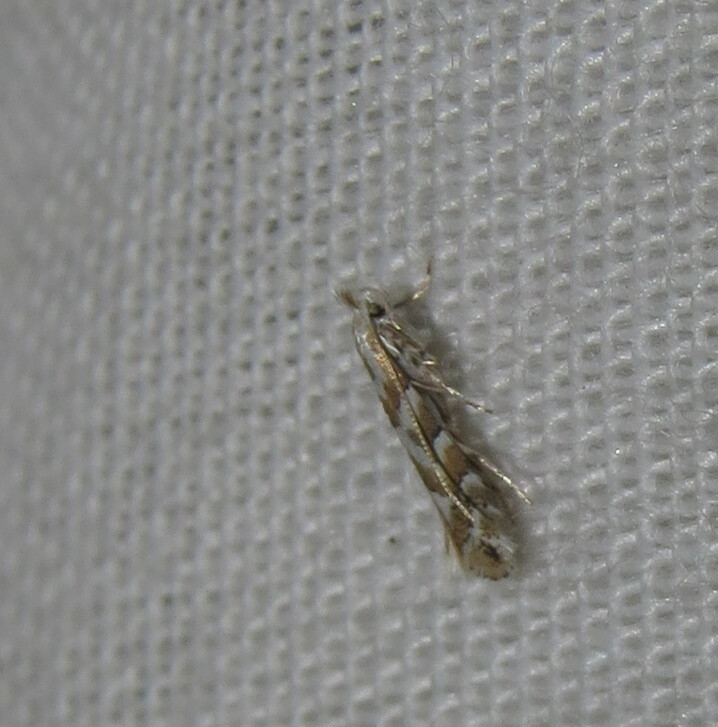 Most Ethmia feed on plants in the Boraginaceae family. 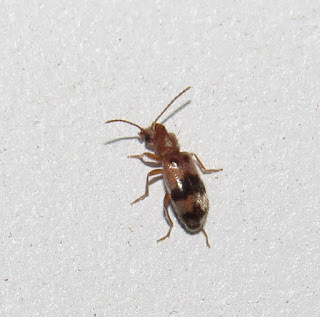 Here is another member of the Depressariidae family that I have not yet identified. They can be confused with tortricid leafrolling moths but for the upturned palps, mouthparts that in this case resemble horns between the antennae. One might expect that pest species would dominate in urban settings, but that is not necessarily the case. 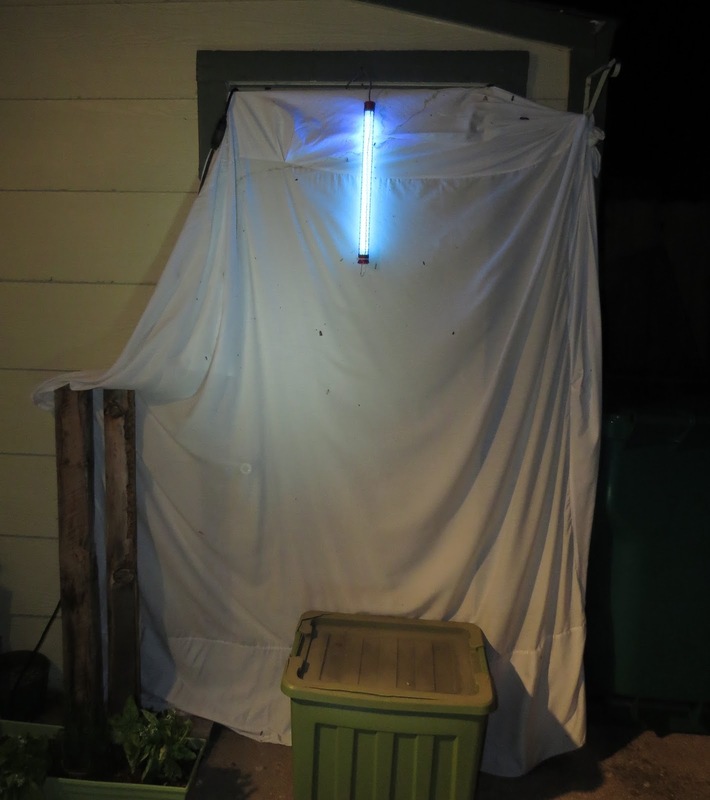 Still, the ornamental crabapple trees in a neighbor's yard probably breed the Codling Moths, Cydia pomonella, that do appear with some frequency at my blacklight. The caterpillar stage is the "worm" in the apple. Some other pests include the Diamondback Moth, Plutella xylostella, a tiny insect (6-8 mm) that feeds as a caterpillar on pretty much everything in the mustard family, including cauliflower and cabbage. It may not be native here, its suspected region of origin being Eurasia, but it is now found in all corners of the world thanks to global commerce. 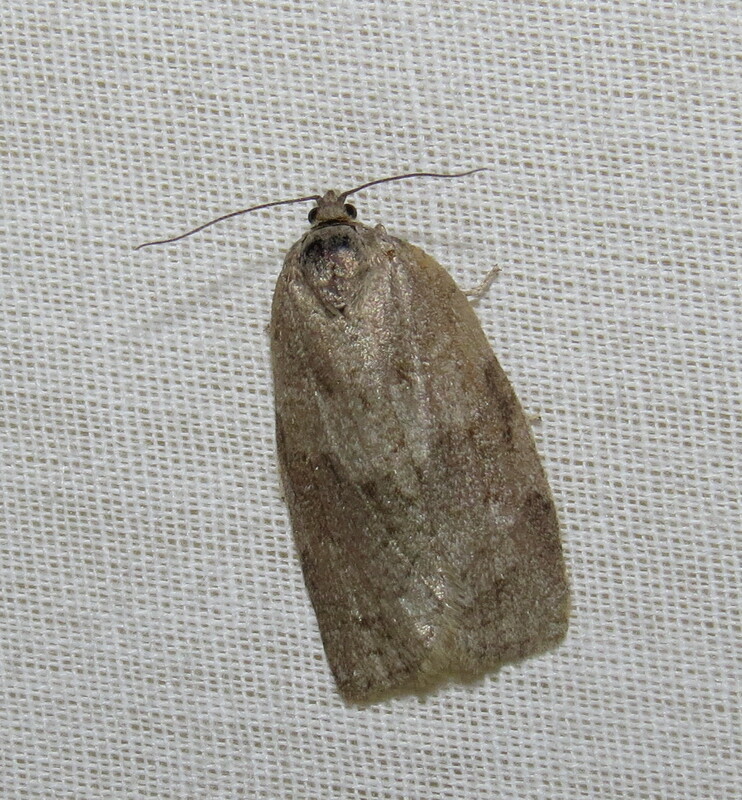 I believe this moth is an adult Spruce Budworm, Choristoneura fumiferana, in the leafroller moth family Tortricidae. 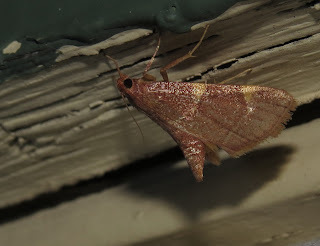 The adult moth is highly variable in color, and prone to wear and tear that further compromise identification. 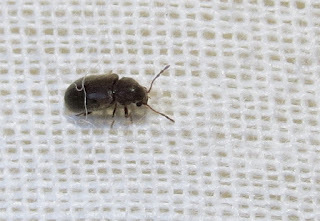 We can at least conclude it is likely in the "fumiferana species group," which includes several other conifer feeders, some of which are notorious pests of western forests. 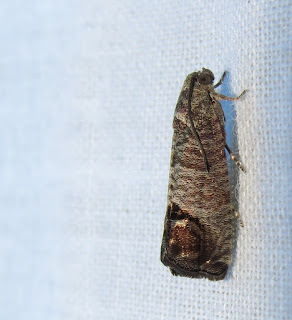 Another related species is the Large Aspen Tortrix, Choristoneura conflictana, of which I think this is an example. As one might guess, the caterpillar stage feeds on aspen, but also poplar, willow, and alder. The caterpillars overwinter, and the older instars roll leaves tightly around them to thwart predators and parasites. Another conifer-feeder is the Ponderosa Pine Coneworm, Dioryctria auranticella. The caterpillar stage feed in cones, but occasionally on twigs, too. 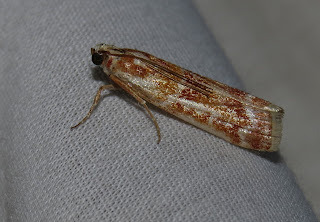 The Pink-fringed Dolichomia, Hypsopygia binodulalis, is named for the genus it was formerly placed in: Dolichomia. 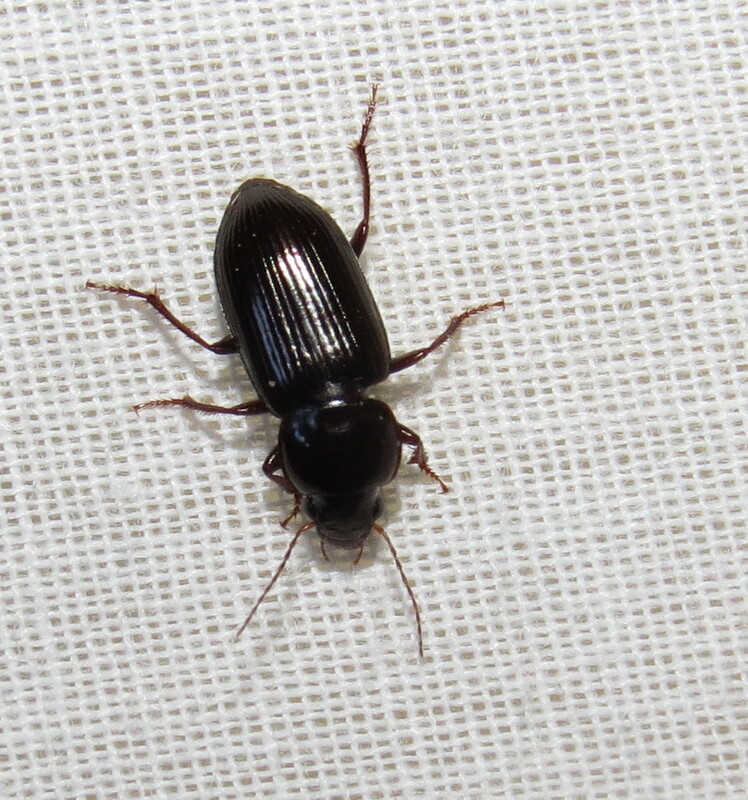 Little is known of its biology. 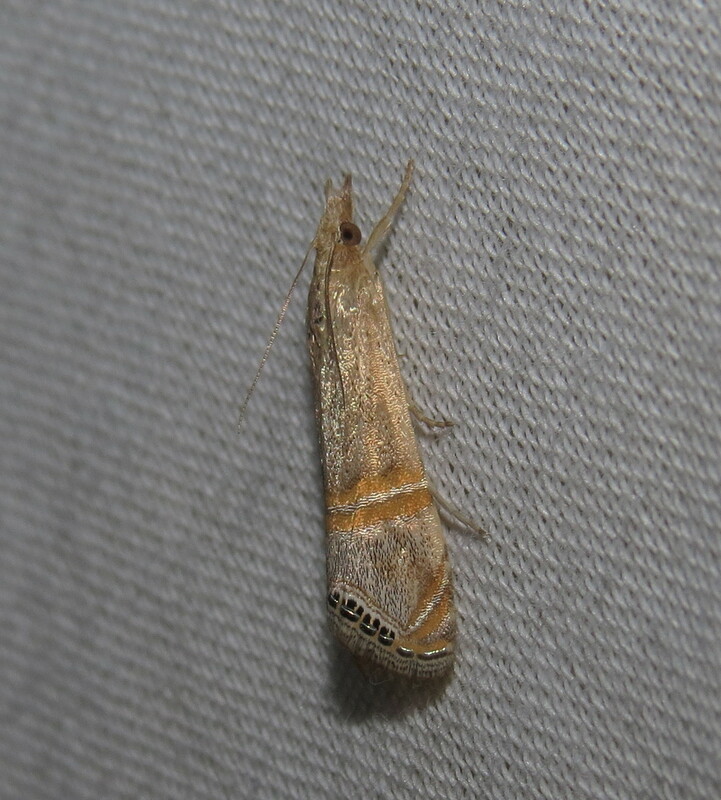 The Belted Grass-veneer moth, Euchromeus ocellea, is one of the more ornate "snout moths" in the family Crambidae, most of which are associated with grasses as caterpillars. This one may be lovely to look at, but its larva feeds on the roots of corn. 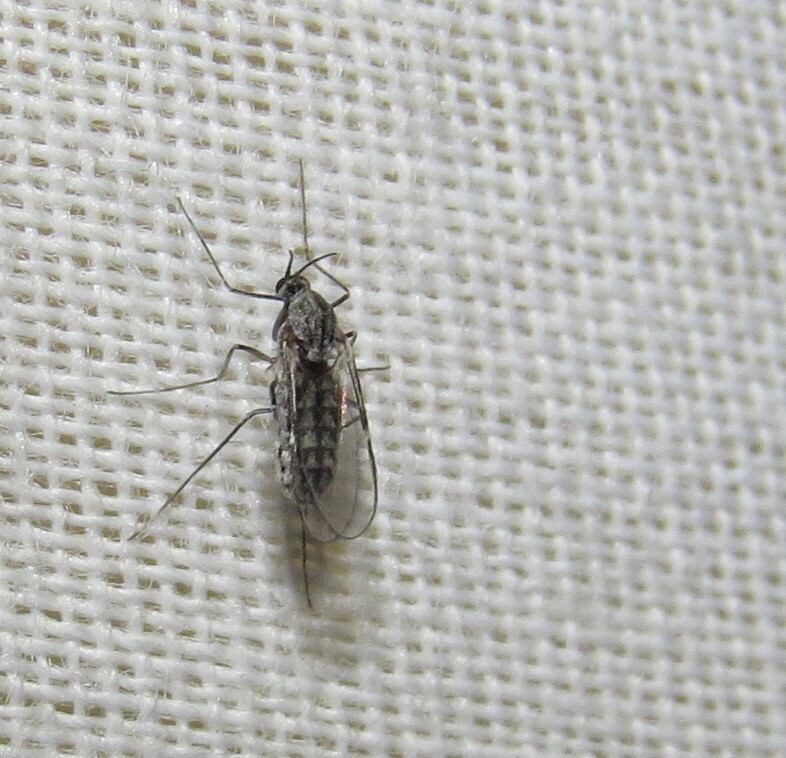 It may have originated in Europe, where the species was first described. Only a couple larger moths surfaced at my place during National Moth Week, and those were both in the owlet moth genus Lacinipolia. One cannot tell the species apart just by looking. 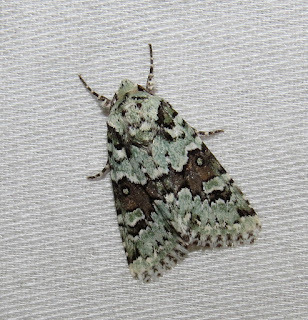 One was a mottled gray, with reflective scales on its wings; the other was a lovely green, and probably rests by day on lichen-covered tree trunks. Some insects can be mistaken form moths, and chief among them are caddisflies like this one. 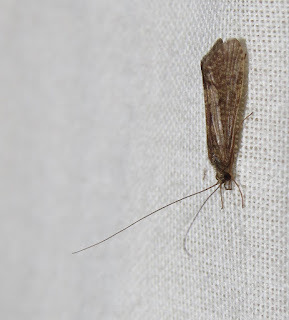 Indeed, caddisflies, order Trichoptera, are essentially aquatic moths. Their larvae typically build cases of plant or mineral matter, or spin nets to filter microbial organisms from stream currents. 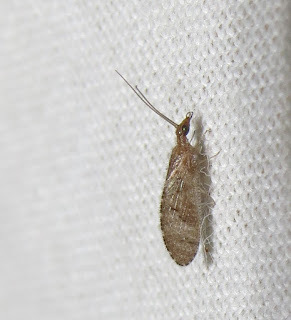 Brown lacewings in the family Hemerobiidae, order Neuroptera, also resemble moths at first glance. 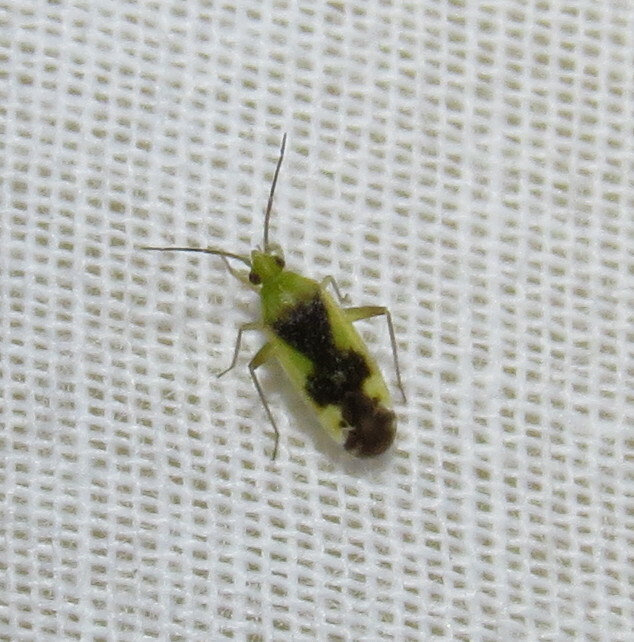 Their larvae are voracious predators of aphids and other small insect pests, so their appearance is always welcome. 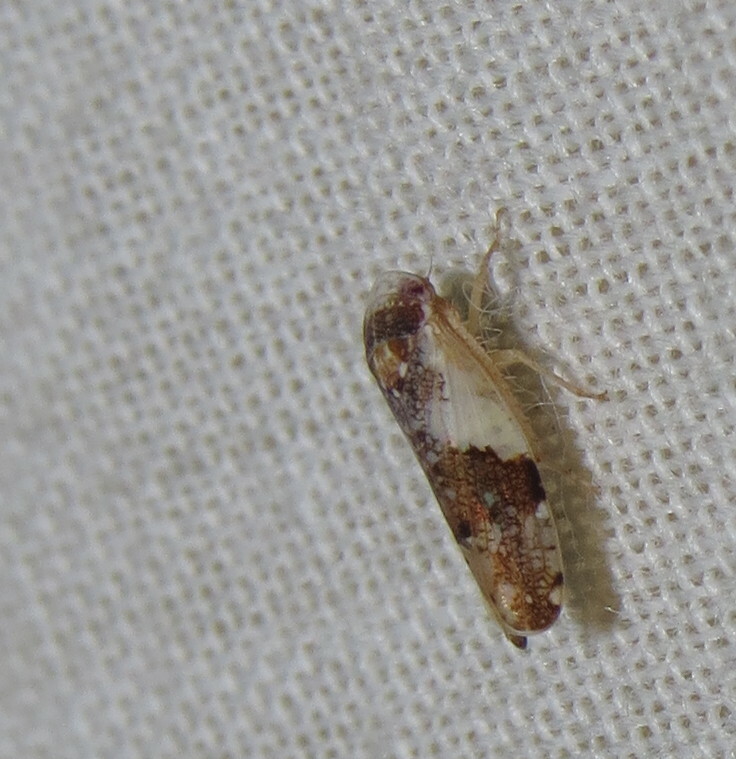 When you begin looking at the smaller moths, you may be fooled by leafhoppers like Norvellina pullata that can be as colorful as moths. 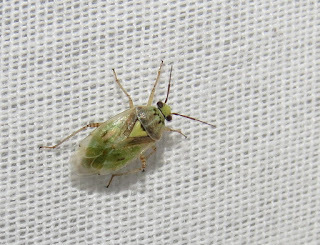 Leafhoppers are true bugs that have piercing-sucking mouthparts they use to tap plant sap. Oh, look, here is an actual moth, about the same size, if not a bit smaller, probably in the genus Phyllonorycter, family Gracillariidae (Leaf blotch miner moths). 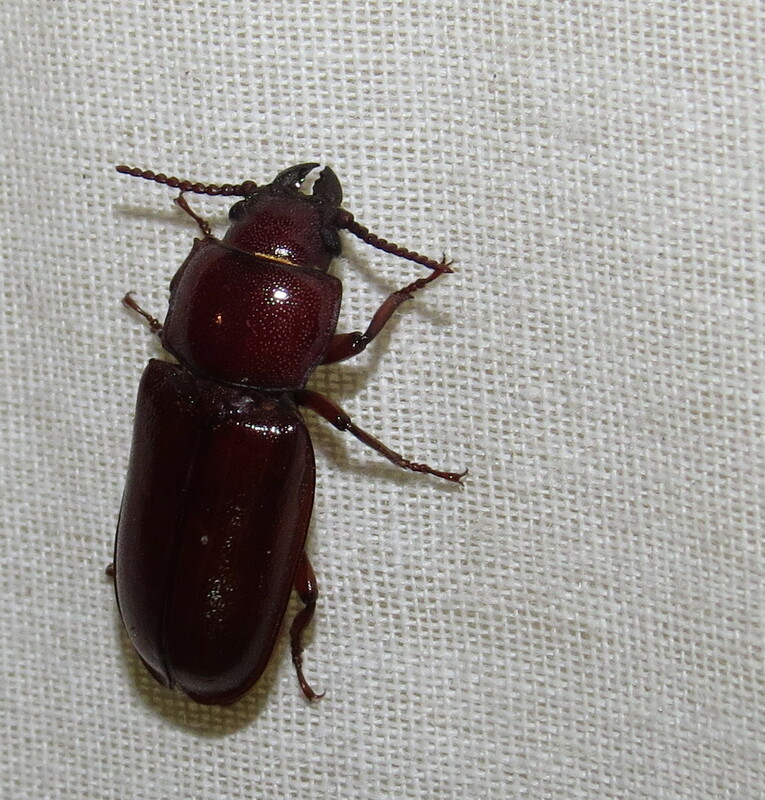 Many other insects come to lights at night, and the most obvious are probably beetles. 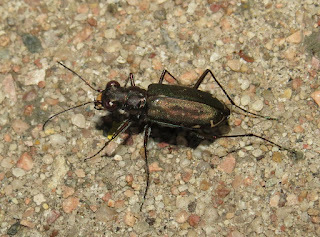 Predatory species like the Punctured Tiger Beetle, Cicindela punctulata, normally a swift, day-active hunter of other insects, and various ground beetles are common at lights. 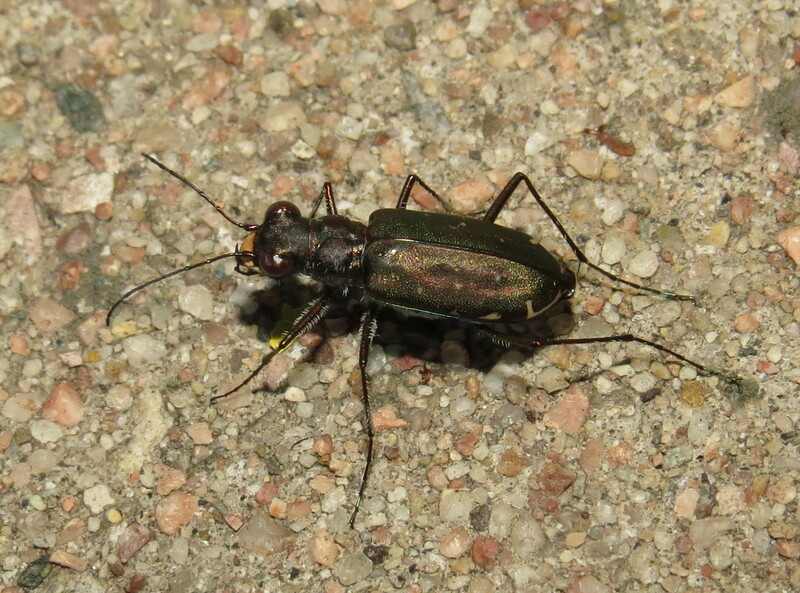 Ground beetle, maybe Bembidion sp. A real surprise on July 24 was the appearance of a Pole Borer, Neandra brunnea. This insect is in the longhorned beetle family Cerambycidae, but it is anything but typical for that group. 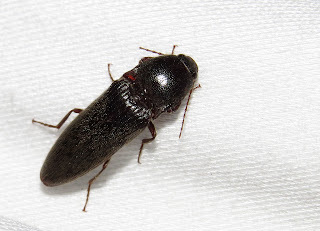 The antennae are short and bead-like, the jaws suggestive of a ground beetle or small stag beetle. The larval stage bores in decaying wood, including poles and posts in contact with moist soil. Click beetles in the family Elateridae are also very commonly drawn to lights at night. They are bullet-shaped, and often covered in short, dense hairs that make them slick. Try grabbing one and it will likely slip right through your fingers. 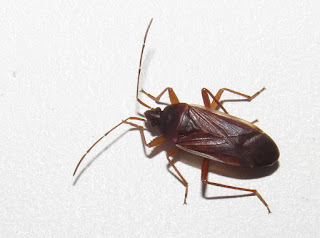 If you are successful, you may be startled by a jarring "click" as the beetle snaps a spine into a groove on its chest. This can free the beetle from many small predators, and catapult it away from danger, too. Tinier beetles include shining flower beetles, family Phalacridae; deathwatch beetles, family Ptinidae; and ant-like flower beetles, family Anthicidae. Antlike flower beetle, Notoxus sp. True bugs, besides leafhoppers, are always a fixture at lights at night, too. 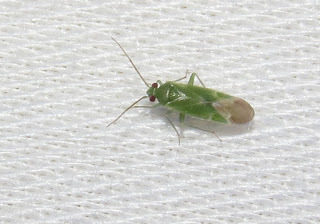 Plant bugs in the family Miridae are diverse if not abundant. Phoytocoris spp. are usually gray or brown, and mostly plant-feeders. 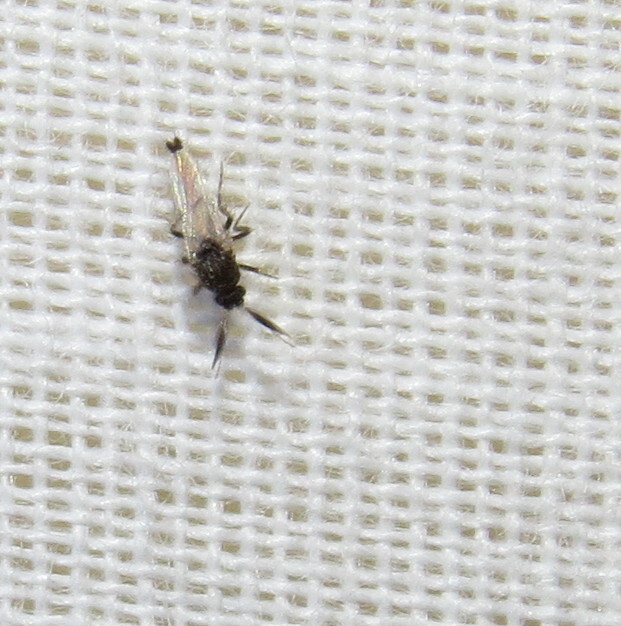 They will occasionally prey on smaller insects, though. 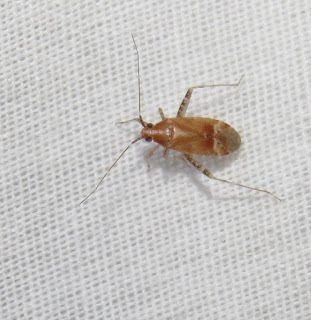 Orthotylus spp, Ceratocapsus spp, and the distinctive Reuteroscopus ornatus, are typical visitors to my blacklight, along with Lygus spp (or a lookalike genus). Mirid plant bug, Phytocoris sp. Mirid plant bug, probably Orthotylus sp. 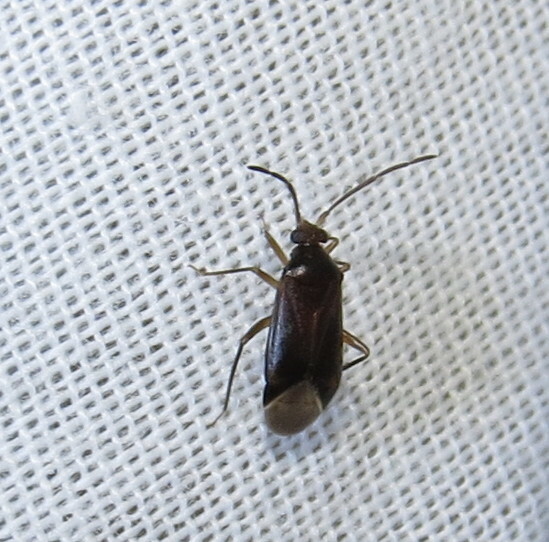 Mirid plant bug, maybe Ceratocapsus sp. Mirid plant bug, possibly Lygus sp. 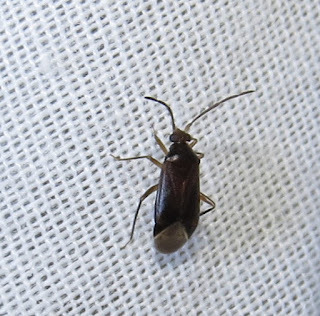 The large dirt-colored seed bug Balboa ampliata visited on July 24. 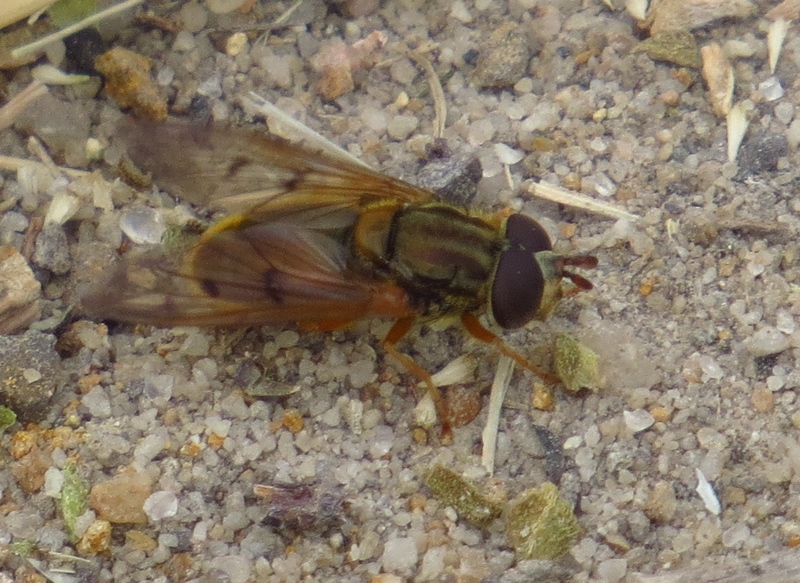 It may be a more common species than I first suspected, as I have found it in other prairie and foothill habitats around Colorado Springs. 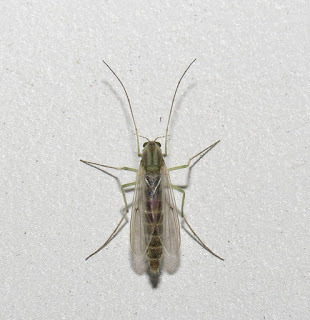 As the name suggests, these bugs feed on plant seeds. 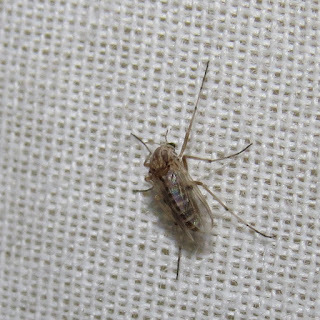 One cannot escape the presence of true flies at any time of day or night, and many species are attracted to lights. 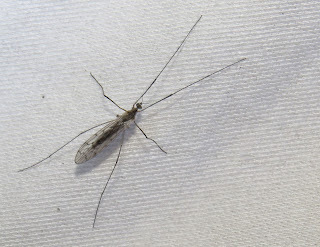 Crane flies in particular are almost guaranteed visitors. 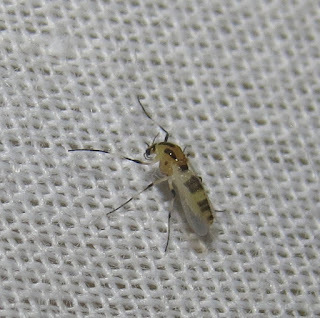 Tiny gall midges in the family Cecidomyiidae are also common. Larvae of many species live in galls on plants. 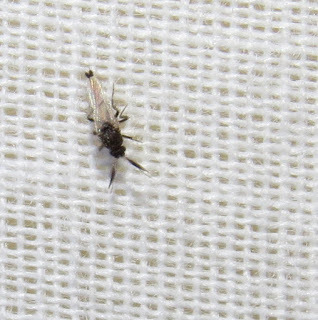 Biting midges in the family Ceratopogonidae, the "no-see-ums," are also present. 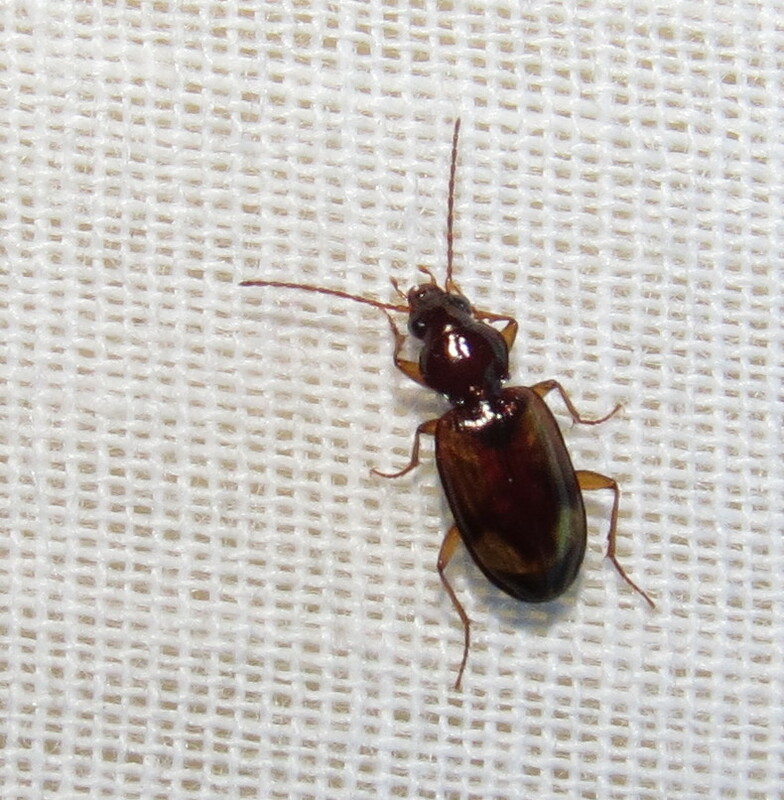 Fortunately, most members of this family feed on the blood of other insects, not people or pets. 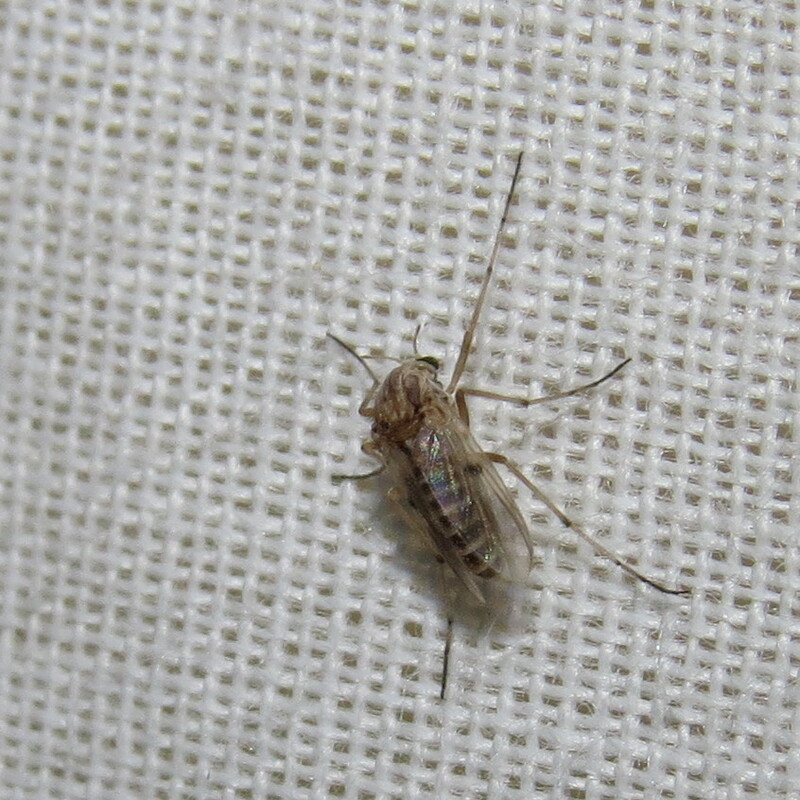 Non-biting midges in the family Chironomidae can be overwhelmingly abundant, but they do not bite. 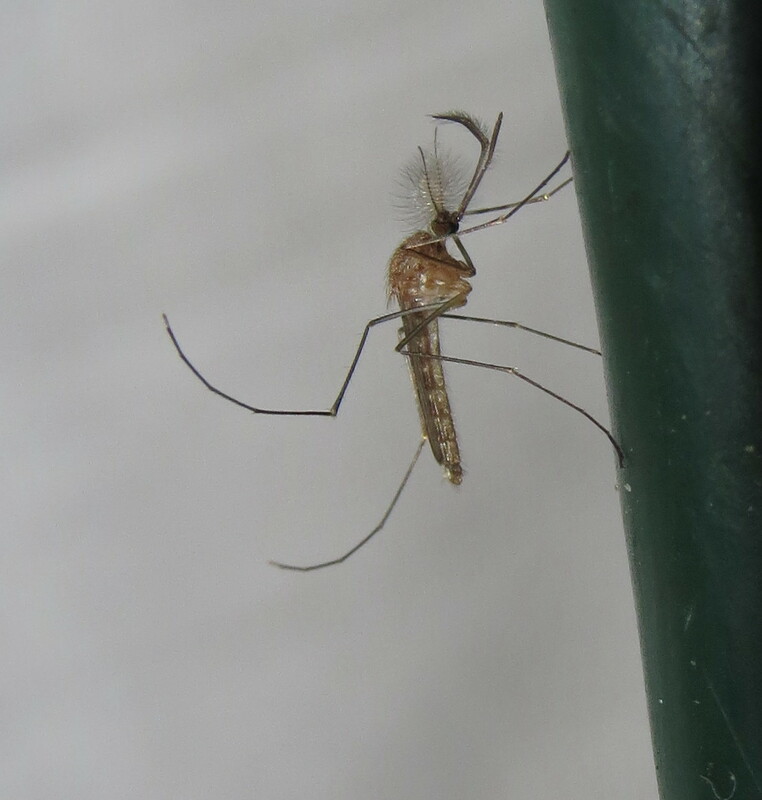 They look enough like mosquitoes to cause needless consternation, but neither gender usually feeds on anything. They live their very short adult lives by using the fat reserves they accumulated in the aquatic larva stage. 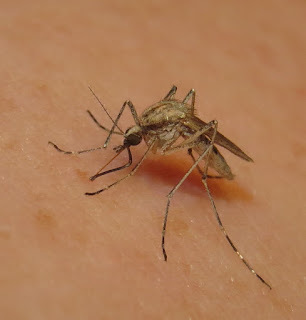 I am rarely plagued by mosquitoes here on the Front Range, but one female did bite me on the arm on July 24. A male, the gender that does not bite, showed up on July 30. Maybe some of the predators and scavengers, like spiders, earwigs (omnivores), and harvestmen ("daddy long-legs," related to spiders in the class Arachnida) are keeping the mosquitoes and other nuisance insects at bay around our townhouse. We can only hope. 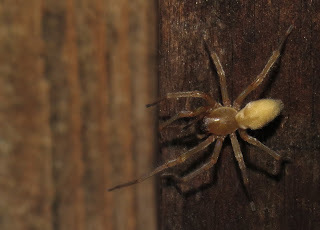 Longlegged sac spider, Cheiracanthium sp.